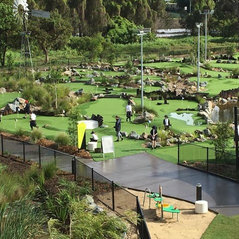 Mini Golf Creations is revolutionising miniature golf. Our courses capture the best parts of real golf gameplay to create unique and addictive experiences. When people think about mini golf courses, many still picture the old putt putt style courses of the 80s and 90s. These courses relied on gimmicks such as fiberglass animals, windmills and clowns, and were predominantly aimed at kids. But at Mini Golf Creations, we’ve completely reimagined and revamped the miniature golf course design, creating experiences for the 21st century. Our courses look, feel and play like a real golf course, but on a much smaller scale. This style of course can be enjoyed by everyone—kids, adults and even avid golfers. 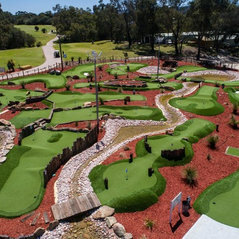 OUR BUSINESS We are a turnkey business that provides all products and services from the design stage to completion, delivering the best mini golf courses in the world, right here in Australia. One of our specialties is mini golf course design. We can create a custom mini golf course to fit the size and shape of almost any site. When you engage Mini Golf Creations to build you a mini golf course, we can take care of everything for you, including: - workshopping ideas - developing concepts - designing the course - detailed planning - building the course - finishing touches like grasses, landscaping, bridges and features. Our completed golf courses have to be seen (and played) to be believed. They look amazing and are so much fun to play. OUR EXPERIENCE Geoff Bennell and Richard Chamberlain started Mini Golf Creations after decades of industry experience. They had a single goal: to create unique and superior mini golf courses that provided unforgettable experiences. Our founders have spent most of their lives as golf course superintendents and mini golf designers, and also have engineering experience. Our unique skills and experience allow us to take care of everything in-house. 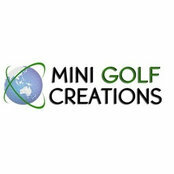 So contact Mini Golf Creations today and let us help you create your dream miniature golf course. 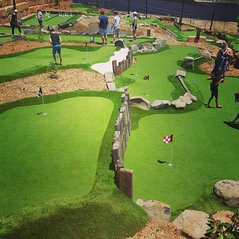 Professional Information:Designers and builders of modern custom mini golf courses across Australia and South East Asia, including Indonesia, Thailand, Malaysia, Singapore and Vietnam. To contact us call +61 07 3823 2009.